A few months ago I had the opportunity to chat with Green Flash's Dave Adams and Luis Carrizo over an awesome beer dinner at The Tipsy Boar. Part of our conversation hit on San Diego's Alpine Beer Company. 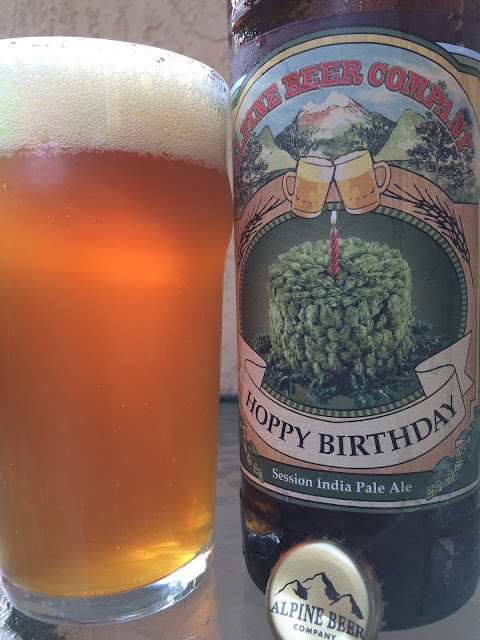 Green Flash had already been contract brewing their beers but at that time recently acquired the brewery. Luis told me to expect some Alpine beers to show up end of 2015, and I saw three of them for the first time yesterday. 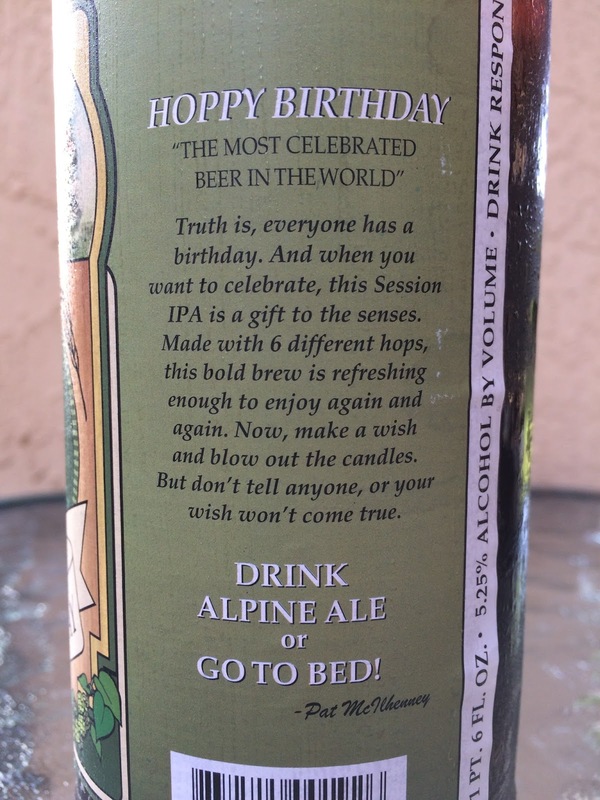 I decided to start with Hoppy Birthday, their 5.25% alcohol Session India Pale Ale. You can see the Green Flash influence right from the start, with the Green Flash imprint on the bomber bottle. The artwork on the label could probably use a round of updates, but I LOVE the concept! 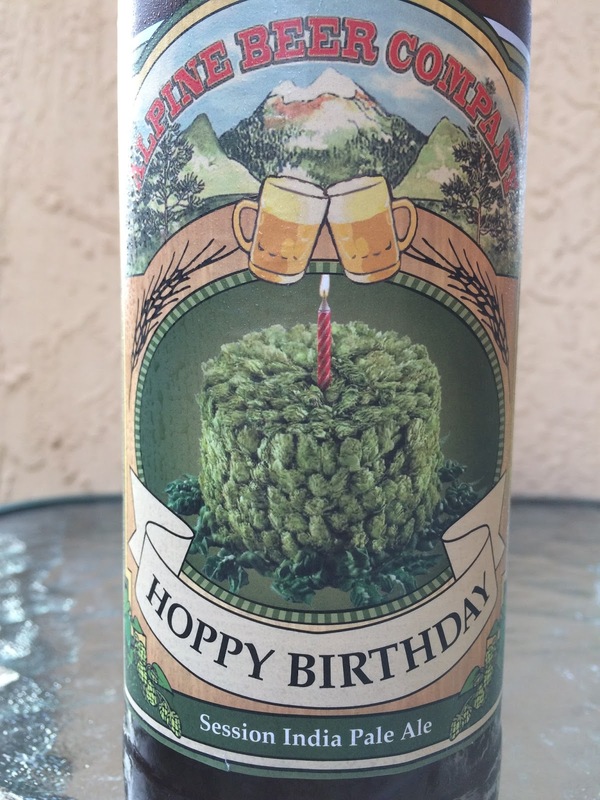 Big round birthday cake completely covered with hop cones. Oh, and one lit candle. Fruity, lightly tropical aroma with some nice sweetness. Likewise, fruity flavors start with orange, tangerine, light mango. Also light on the sweetness once you start drinking. Rather, a pretty substantial pine and citrus bitterness with some definite hoppy dankness! A palate tingler and cleanser for sure. I definitely though this was going to be sweeter and more balanced, especially with the "session" label. And while there was enough fruity, malty sweetness in the background (and more as the beer warmed up a bit), Hoppy Birthday was pretty damn bitter! And I loved that! My kind of session IPA too. Check it out!